Rather weird, isn’t it? I mean everyone hates Mondays especially on social media. Even before Monday dawns, people start cribbing as if it were the end of the world. It has almost become fashionable to do so. After the portrayed or real indulgence of the weekend, Monday seem like a groan. For starters you have to wake up early. Me, I get up almost at the same time all through the week, give or take a few minutes so well! Get into the same routine of getting the kids ready and packed off to school and then settle down after breakfast and sometimes workout with your laptop and work for the day. All of this is true, and that is why I dig Monday. Why, you ask? Because I work from home. And while I am truly grateful that I don’t have to commute to work and can work in my PJs, I do need everyone in the house to be out especially kids to function optimally. That brings me to the realization that we all need that distance from our loved ones to continue to feel connected and actually look forward to spending time with them when they are back in the evening. There is something called as too much of a good thing. And I am not sure if having kids yelling and screaming at home over the weekend even classifies as too much of a good thing anyway. So, come Monday I want them in school in the loving care of their teachers while I get to breathe normally and do my regular work. There is something else that I dig and that is silence. Is it with age or was I always like this? I know I have never enjoyed parties or loud, noisy pubs. The exception is with family or friends and even there I need to take some time off and go sit in my hole to detox from all that noise. Hence, I actually cherish silence. So, I sit alone with my thoughts hearing the sounds of the birds chirping, someone talking in the distance, strains of a lovely song wafting up to me or Coco grunting from his perch and I feel so much at peace. Close your eyes and imagine that. Yes, that’s why Mondays are welcome. So tell me do you look forward to your Monday? Come on, office cannot be that bad, right? I like Mondays other than the waking up early bit. There are very few things that spell ‘comfort’ for me more than a leisurely morning in bed. Then there are some Mondays when it is dark and wet and I feel a little sorry for the kids. But I do cherish the silence once they’ve left. I like that I can put my routine on a priority – go to the gym and finish off my assignments. I completely love being alone at home. I even grudge the maid’s presence sometimes. But I completely and heartily agree with all your points. I need my space, my quiet time and my work from home space to myself. One of the biggest pluses of working from home is silence and I lose that when people stay home when they’re supposed to be at school/work 😉 And yes it’s not an age thing, it’s a personal thing. Bilna Sandeep recently posted…How to stay productive as a Blogger with a Full Time Job? Yes, it is stressful to be around a little kid for longer stretches of time. Been there and definitely did not dig it. Now I am in a happier space with older kids who can take care of themselves and hence I get more leeway to do things my way. Monday mornings is actually restful for me. Everyone leaves the house, except me. Because of timezone differences, there is not much action on Monday mornings. So, I can relax a bit. So, I meet another kindred soul. That’s good to know, Lata. I can bet that your mom feels this way as well. Unless you guys are really are quiet and well-behaved at home. 🙂 Aha, so college starts. Good luck with that. Oh, I love silence and my solitude! We need our shares of solitude. Thanks, Tarang. 🙂 Looks like a lot of us enjoy our Mondays. Sid recently posted…Would you like to know me better? I think I liked Mondays even when I was a part of the corporate life. I guess, back then it was about being with people. Have loved Monday’s as I felt rejuvinated after weekends to start afresh as I loved my work:) Sounds unusual but true! Welcome to the Monday loving group, Prasad. ? Very contrary to your post, I dislike Monday. I find it very difficult to give up laziness and comfort of my bed for office work. Hehe Good to hear a voice of dissent, Swati. ? To each their own. I hate mondays 😛 But then I have to face the commute and office ! If I had your reasons htough, I would love Mondays too ! I love every day. 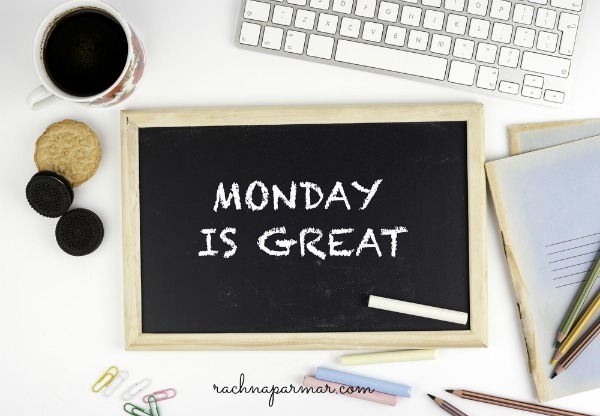 I love Mondays especially because I work late on Sundays so I have Monday mornings off to…. yep …. crank up the music and … clean! I keep Mondays kind of light on work these days. I enjoy working from home and catch up on little chores and errands. But when I had a regular job, I still adored Monday. It always implies a fresh new week with so many possibilities. I love Fridays a wee bit more than Mondays. I like your strategy on Monday. For me, except for household chores, I avoid working on a weekend so I am raring to go on Monday morning. Exactly! Yeah, that could be it for some folks. They don’t feel rested enough during the weekend. Ha Ha, I so agree with you. Sometimes I do feel guilty as hell for wanting that silence. And feel a wee bit jealous of mothers who seem to actually enjoy the ruckus. But I have made peace with myself. I am the one who enjoys the quiet, loves my job(though I do have to get out of my pjs for that!) and feels that schools were God’s gift to mothers! My only wish is that I had one sunday to finish my chores and another one to do what I want to! !